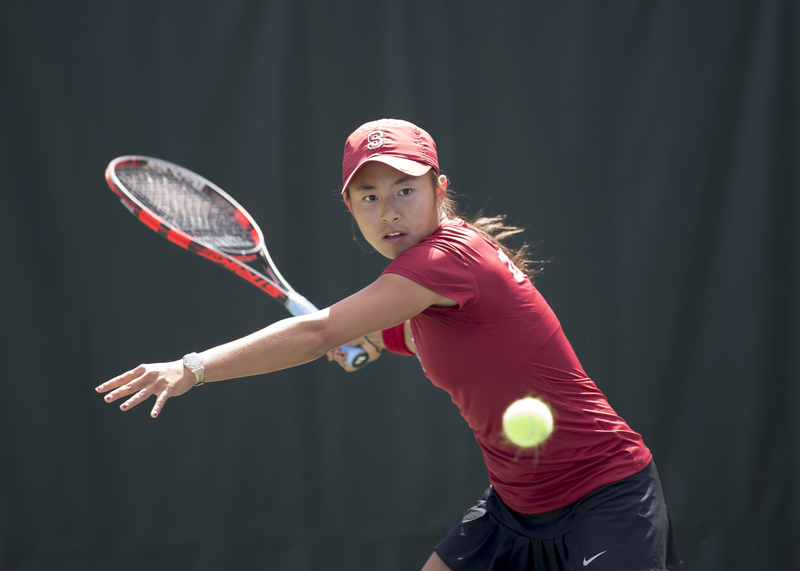 Stanford sophomore Carol Zhao picked a great time to notch her first career WTA win, as the 2014 singles All-American won her first match at the highest level of women’s tennis in a tournament on the Farm. Zhao capped off a tremendous run at the Bank of the West Classic after having advanced through the qualifying rounds into the main draw as a wild-card selection with a first-round rout of Yanina Wickmayer 6-2, 1-0 (ret.). Wickmayer retired in her match with Zhao after only 36 minutes due to a viral illness, as the Belgian native simply could not keep up with the 2014 All-Pac-12 second-team selection. Zhao won an outstanding 82 percent (14 of 17) of her first service points while also notching five aces in the brisk contest. In pushing Wickmayer’s challenge aside, Zhao also broke the No. 65 ranked player in the world on two out of three total opportunities. Zhao was able to take on Wickmayer after a fine run in the qualifying stage of the tournament last weekend. After receiving a wild-card bid in the Bank of the West Classic, the Ontario, Canada native took down No. 2 qualifying seed Katerina Siniakova in a three-set thriller 5-7, 6-4, 7-6 (3). The win over Siniakova set up Zhao for a second qualifying match, with a spot in the main draw on the line; in a back-and-forth match with Russian native Marina Shamayko, the No. 9 qualifying seed, Zhao prevailed in another three-set nail-biter, 6-1, 1-6, 6-4. Zhao’s run ended on Wednesday with a 1-6, 1-6 loss to Ana Ivanovic, the No. 5 player in the world. Ivanovic, the 2008 French Open winner and former world No. 1, dominated her second service points in eliminating Zhao; Ivanovic won 75 percent of her second service points (18 of 24), compared to a measly 18 percent (3 of 16) for Zhao. Ivanovic also broke the 2013 Tennis Canada Junior Player of the Year on five out of six total chances. Kristie Ahn ‘14 and sophomore Caroline Doyle also participated in the Bank of the West Classic. Ahn, a three-time singles All-American for the Cardinal, received a wild-card spot into the main draw. However, Ahn lost in the first round to fellow American Coco Vandeweghe in straight sets, 2-6, 5-7. Vandeweghe, despite double faulting seven times against Ahn, was able to advance at the hour and 20 minute mark. Neither player was on point in the sloppy match, as both players converted less than 50 percent of their second service points. Doyle, a San Francisco product, was not able to make it out of the qualifying phase of the tournament after drawing a very difficult matchup in No.1 qualifying seed Aleksandra Wozniak. Wozniak, the No. 101 player in the world, ended Doyle’s time at the Bank of the West Classic with a 7-5, 6-3 win. On the doubles side of the tournament, Zhao and Ahn, Stanford’s No. 1 doubles team in 2014, teamed up once more to compete in the Bank of the West field. Zhao and Ahn lost a three-set thriller in the first round on the doubles side to the team of Caroline Garcia and Shuai Zhang, 6-3, 1-6, 10-12. Zhao and Ahn, who went 29-6 as a team this past season, nearly took down Garcia and Zhang, with 15 first service point winners in the first set of the match. However, Zhao and Ahn were only able to win seven combined first service points in the final two sets of the contest. The Bank of the West Classic was also in the news because of Sabine Lisicki, as the German native broke Venus Williams’ record for the fastest serve on the WTA tour. Lisicki, the No. 29 player in the world, blasted a 131 mph serve in her first round match against Ivanovic. The powerful serve came at 5-5, 40-30 in the contest between the two top players. Contact David Cohn at dmcohn ‘at’ stanford.edu. David Cohn '15 is currently a Sports Desk Editor. He began his tenure at the Daily by serving as a senior staff writer for Stanford football and softball, and then rose to the position of assistant editor of staff development. He served as the Summer Managing Editor of Sports in 2014. David is a Biology major from Poway, California. In addition to his duties at the Daily, he serves as the lead play-by-play football and softball announcer for KZSU Live Stanford Radio 90.1 FM.